Today, we’re happy to announce the general availability of our SAP S/4HANA Cloud 1808 release. With our recent 1805 release, we showed that we’re supporting a truly intelligent enterprise suite. And this quarter again, we’re bringing even more intelligence to our SAP S/4HANA Cloud by adding new machine learning (ML) use cases, predictive analytics, as well as scenarios leveraging our digital assistant, the SAP CoPilot. This blog provides you with the latest and greatest 1808 highlights of our next-generation, intelligent cloud ERP solution. Check out my video below for a quick overview of the smart innovations that power the customer journey to the intelligent enterprise suite. In the area of Finance, we’re introducing Smart Alerts in SAP Financial Statement Insights with our SAP S/4HANA Cloud 1808 release. This brand-new business exception detection aims to detect unusual business situations in revenue and cost accounts. By pro-actively informing the group controller of potential issues and proposing explanations for unusual business situations, the system takes over a huge amount of manual efforts which Chief Finance Officers usually need to tackle. Another intelligent innovation in the Finance area is the anomaly detection with SAP RealSpend. The expense monitoring application is designed to enable managers to always stay ahead of their cost situation. With its new anomaly detection feature, SAP RealSpend is leveraging machine learning in order to automatically detect unusual expenses in the areas of wrong bookings, seasonal effects, unusual amounts or fraud. This service allows managers to stay ahead as unusual business situations can be detected early in time, and at the same time it decreases efforts for investigation of uncommon expenses. In the area of Manufacturing, we release capacity evaluation and adjustment. 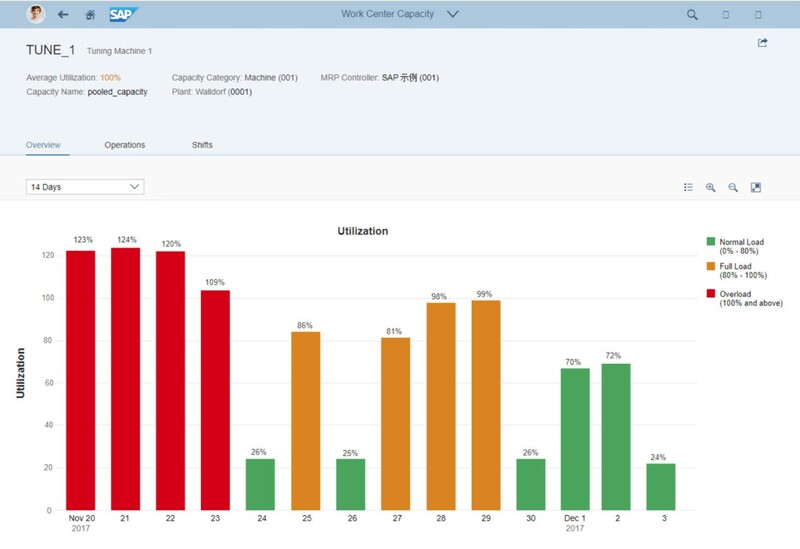 Within the SAP Fiori “Manage Work Center Capacity” app, you can now detect and resolve overload situations. Within a specific horizon, you can evaluate the capacity load situation of work center capacities, and also visualize the utilization based on bucket types such as shifts, days or weeks. By viewing the backlog of overdue orders and operations for work centers, you can now ensure that you’re optimally utilizing its capacity. Another highlight of the 1808 release is part of Demand-Driven Replenishment, our intelligent approach to ensure best possible customer service levels at lowest possible inventory costs. With our latest release, we offer the visualization of buffer positioning by a network graphic. This graphic enables production planners to easily display the position of decoupling points in a multilevel bill of material. Additionally, we also deliver a machine learning service which supports the prediction of lead-times for stock transfer materials, thereby improving the estimation of stock transfer lead time. One of the intelligent highlights in the area of Professional Services that is part of the 1808 release is the Cap in Time and Expense Billing. As project manager working on a time and expense project, you can now define an upper cap limit for the services at billing line item level. When creating projects, managers can define the cap which represents the upper limit of the amount negotiated with the client. Moreover, in Professional Services project managers can now make use of the new staffing analysis application. Designed in a flexible column layout, this newly introduced SAP Fiori screen allows users to review the upcoming project demands in terms of required resources across projects, as well as the respective supply and effort distribution. This feature is available for both the resource manager and the project manager role. As part of our 1808 release, we offer simple project control data maintenance. The SAP Fiori App “Project Control”, which we already introduced with our 1805 release allowing simple project creation, now includes new standard fields to categorize projects. Project Financial Controllers are now enabled to define the project type and also the priority of a project. This highlight not only reduces the efforts in simple project creation and control data maintenance, but it also builds the basis for a multidimensional analysis. With 1808, a new app called “My Projects – Key Figures” is introduced. This report function to balance projects is a huge help for steering committee members as they can now properly track the status of their projects. With the new app, they can easily analyze projects by different measures and dimensions, e.g., project types, statuses, priorities, or even financial information. Leveraging this view of key project data supports steering committee members in identifying risks in time. 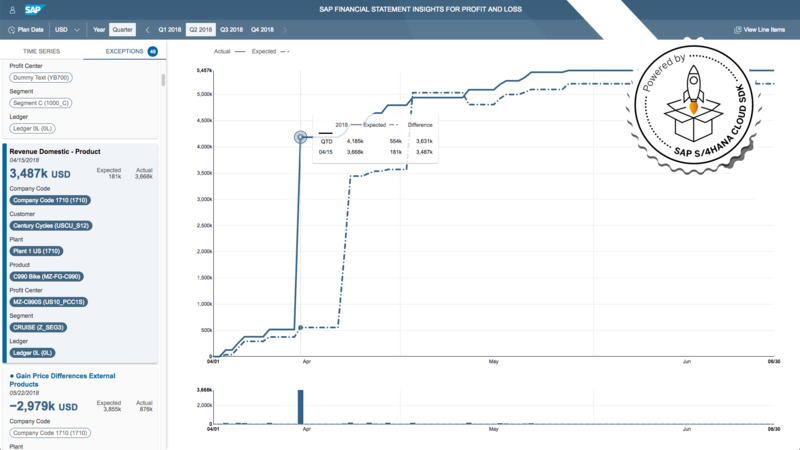 In our 1808 release, we also offer a new SAP CoPilot highlight in the area of Sales. The tracking of sales orders is now simplified as users can make use of natural language. Within the “Track Sales Orders” app, you can easily find sales documents and the respective process phases. The system not only provides an overview of the current process phase, e.g., whether the document is in order/delivery processing or invoicing, but it also enables the display of further information such as customer reference or sold-to party. Another intelligent feature in Sales is Predictive Analytics for Sales Forecasts. 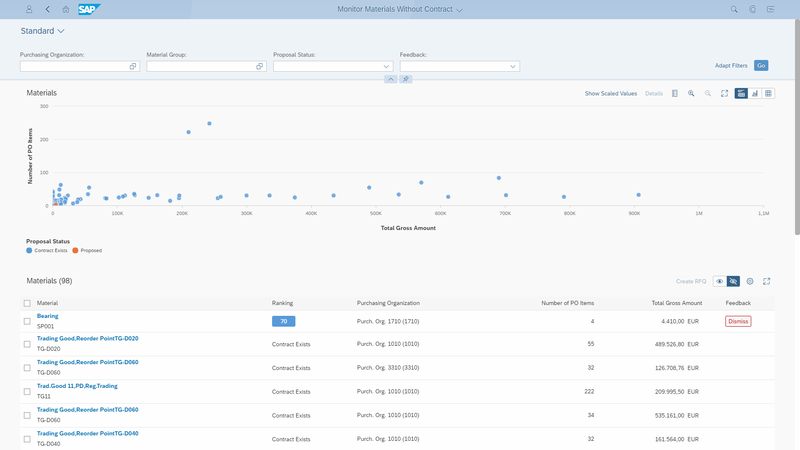 With the “Sales Performance – Predictions” SAP Fiori app, you can utilize embedded predictive analytics functionality in sales business processes. Sales managers can select existing sales plans and analyze to what extent their sales targets are being achieved, leading to an improved sales forecast and increased accuracy in requirements planning. In Sourcing and Procurement, we offer another machine learning scenario which helps procurement organizations to automate their business processes. Whenever there are open purchase requisitions with materials that don`t have any purchase contracts, operational purchasers can now make use of the new proposal of options for materials without purchase contracts. The new ML algorithm proposes possible bundles for an RFQ to be sent out, thereby contributing to an intelligent no-touch, automated world. Another highlight which supports automation is the possibility to configure a relationship between material groups and purchasing groups. Once the relationship is configured, the responsible purchasing group will automatically be determined by the system whenever a material group is entered in the professional purchase requisition app. This feature not only leads to further automation of the process, but it also very useful for compliance purposes. As the shift to the cloud is accelerating, “hybrid” plays a key role in this transformation. With the new Hybrid Cash Management and Hybrid Treasury deployment options, it’s now possible to have Treasury and Risk Management in SAP S/4HANA Cloud, and keep the other finance module, e.g., accounts payables/accounts receivables, in an existing ERP environment. Accounting documents and bank account information are transferred from SAP S/4HANA Cloud Treasury and Risk Management to the ECC. Cash flow information is transferred from ECC to SAP S/4HANA Cloud Cash and Liquidity Management. In this release we continuously increase our global coverage with three additional country localizations for SAP S/4HANA Cloud, namely Finland, Poland, and Saudi Arabia. This brings us to a total of 36 countries, and with our added languages Finnish and Polish we now support 20 languages in total. In addition, we further deepen the localizations for our existing countries regarding features and content across the functional needs of our customers. Just to name two examples, we enhanced the Advanced Compliance Reporting (ACR) for cash flow statements to fulfill the requirements of the government in China, as well as enabled the integration for Third-Party Warehouse Management for various additional countries. What’s more, SAP S/4HANA Cloud recently became SAP’s first cloud service to receive a C5 attestation, which supports stringent compliance requirements, particularly for highly-regulated industries such as banking and insurance. If we’ve peaked your interest for more, stay tuned for the updates that my colleagues will be providing within the next couple of days.